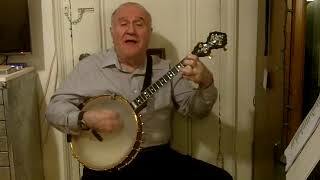 The Manhattan Minstrel Eddy Davis playing and singing a 1924 song written by Isham Jones & Gus Kahn. It was recorded by everybody including Satchmo, Merle Travis, Paul Whitman, Cliff Edwards, - you name 'em. Davis is playing on his Custom OME 12" head - 17 fret Tenor Banjo. I'm in. Great playing Eddy. I love your upper movements. Great choice. Went to my first ever Django/gypsy jazz jam session last week and this tune was played but twice as fast! Mainly I sat and listened and smiled. I love that song. Do you have a chord sheet for it? http://www.dpsol.net/test/The%20Firehouse%20Jazz%20Band%20-%20Dixieland%20Fake%20Book%20-%20www.tallerdetrompeta.blogspot.com.pdfBud, I think you can find a sheet on this free firehouse jazz site. I don't quite know how to get the sheet up separately here. Here's another. I hope lots of people post, I love this song. That's a mighty tune and very well played by you David. Impressive. I learned that at one point and then forgot it (like I do with a lot of tunes) so I'm back at it and hope to have something soon to share. Nice renditions Eddy and David. Thanks Joseph, and Thanks for the links! Very Cool. Thanks Mike......I know what you mean about forgetting songs....I do it all the time, and have to revisit. Can't wait to hear your version! I hope you join in on this one Paul? 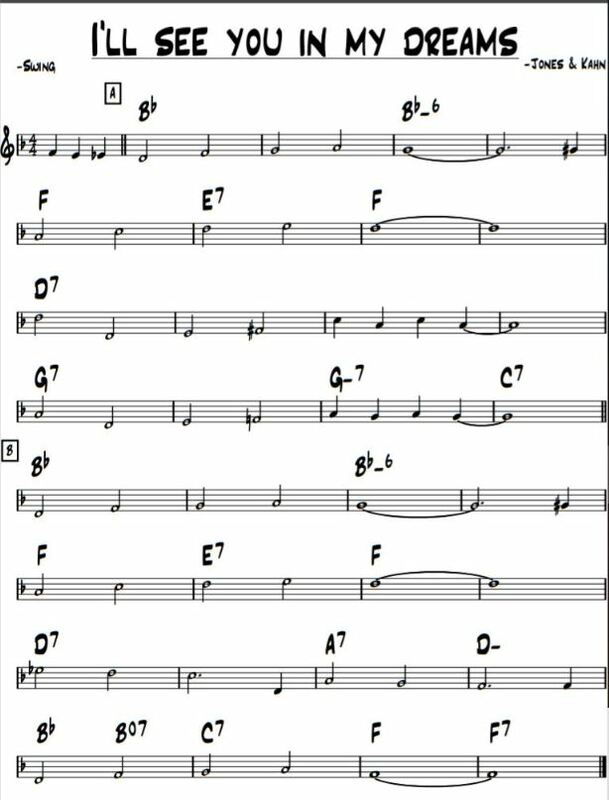 Here's the chord progression in the chorus that I see from the original sheet music of "I’ll see you in my dream" from the url in the earlier posts. I haven't yet absorbed Eddy's to see what mistakes I made. Here's the dots out of the Django Fakebook ....... you can download this free off Google. ..... Don. Ps. If you want to enlarge this music, right click it, then left click ''Open Link In New Window'' ..... it'll then be a lot clearer. Eddy and David, I really see you in my musical dreams! Thanks Marco! and thanks for the sheet Don. I hope you guys post your versions. Two of my favorite players! Thanks, Don, for that sheet. Do you have a link for that fakebook on Google? 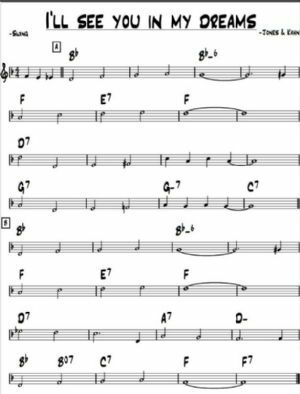 In some tunes, incudeing this one, you'll have the written sheet music, then followed by Django's very own improvised arrangements that you might want to try. .... Good luck, Don.